When it doesn’t fit anywhere else. Hey how’s it going? My name is Rich and I’m what people call an introvert. I’ve been one for 43 years so I’m an expert at it. I decided that today’s blog should be about how that works. I’ll tell you what it means, and what it doesn’t mean, and how I’ve learned to embrace it. I’ll also tell you what you should and should not do with the introverts in your life. I will do so by writing about myself, but the truth is I am writing about all introverts. Maybe it will help, maybe it won’t. But I hope you’ll read and think about it. First, I think I’ll start with what it doesn’t mean, and thus dispel a common misconception. I’m not shy. Far from it in fact. I make my living presenting to groups of 20-30 adolescents multiple times per day. I have presented to groups of 200 people and up. I have performed in musicals in front of theatres full of people. 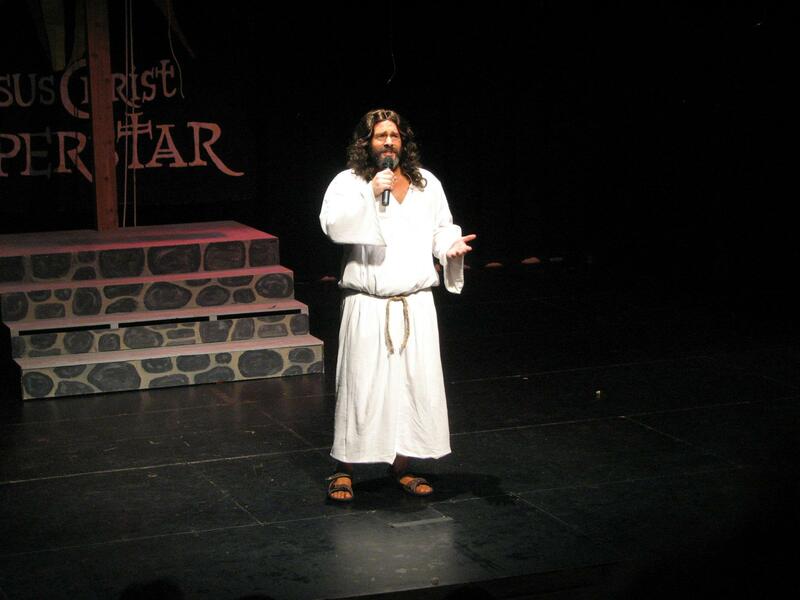 I played Jesus in Jesus Christ Superstar. I competed in a bodybuilding competition wearing nothing but a tiny speedo type thing in front of hundreds of strangers. None of these things make me nervous. In fact, I thrive on it. The more people there are for me to present to, the happier I am. When I meet people for the first time I always look them in the eye and extend my hand readily. I am happy to have a meaningful conversation with a stranger and I don’t feel insecure in new situations. These things may make you want to conclude that I am wrong about myself. That in fact I am not an introvert. But I can assure you I am. Card carrying and proud, as they say! What’s funny is that there are a lot of people who know me who are legitimately surprised when I tell them I am an introvert. That’s usually because they have only ever seen me in small group social settings, or because they have seen me perform or present. It means they don’t know what it means. So then what does it mean? Well it means that I am happy to spend time thinking. A lot of time. I think and reflect and observe and then I do it all again. When I’m in a large group in a social setting I don’t say much. It’s not because I’m shy — it’s because I don’t have anything to say, and in any case I don’t want to compete for attention because I find it draining. I don’t feel the need to engage in conversation simply because it is a social requirement. I don’t like loud rooms because I can’t hear myself or others talk. I don’t understand why they play loud music in many restaurants when all that does it make it difficult to hear what your companions have to say. I like going to parties but I don’t like staying — I find it’s nice to see everyone but after a while I get overloaded with sensory inputs and I have to leave. Don’t take it personally. The fact that I came means I care about you. If you see me at a party you’ll find me in a quiet corner. You may think I am being stand-offish but nothing is further from the truth. Sit down and let’s have a nice conversation about something interesting. I will listen more than I talk, but I will talk plenty. You’ll probably find that refreshing because I am an active listener. I don’t just listen waiting until there’s a break in what you are saying so I can continue to talk about me — I really listen. And when I talk you’ll find out just how closely I was listening. When I leave I may not say goodbye. That’s only because there was so much going on and I didn’t want to interrupt. I know it comes off as rude sometimes but honestly I’ve found it’s easier to seem rude in one instance than to try and break into an activity to say goodbye. I also like to be fully prepared before I try something new, and I constantly check my progress to make sure things are going as they should. I ask a lot of clarifying questions before I proceed into the unknown. I’m not afraid to try new things, but I like to understand what I’m getting into as much as possible before they happen. When I was a baby my parents laughed at me because when I would turn around to crawl off a chair I would check the floor 10-15 times as I slowly lowered myself to make sure it was still where I thought it was. When I behave this way with you, just answer my questions patiently and we’ll both be happier for it. Being introverted means I spend a lot of time observing people. I don’t judge quickly because I’ve learned that the longer you pay attention to someone the more you learn and the more layers you see through. This means I understand most people better than most people. It also means that a lot of people think I’m a snob. I can’t tell you how many times I have been called that. My lack of talking comes off as snobby and disinterested. It simply isn’t true. My lack of talking has everything to do with me thinking about what is worth saying. The truth is there’s not much that is. Most people talk because silence makes them uncomfortable. I love silence — it lets me think. I’ve also had a lot of extroverts try to “cure” me. That’s one of the most uncomfortable things an introvert learns to deal with. Please don’t get me wrong though. I love extroverts. I enjoy watching how much fun they have doing things that would give me no pleasure at all. I love how they can come into a new situation and within minutes be best friends with everyone in the room. It’s cool. Super-cool. But it’s not me and never will be, and I don’t care because I’ve tried it and it did nothing but make me uncomfortable. One of my favourite examples of extroverts’ deep need to cure me is during the Hora dance, which my Jewish readers will be intimately familiar with. For the non-Jews who don’t know, it’s a kind of dance that an entire room gets involved in. The step is very simple and involves everyone holding hands in a big circle, although very often there will be concentric circles when the number of people in the Hora results in a circumference that exceeds the dimensions of the dance floor. When the Hora music starts up, all the extroverts get a fire in their eyes. They leap from their table and charge to the dance floor, grabbing the hands of everyone they pass on the way. It’s like ecstasy in a dance beat. If you watch the introverts though, you’ll see them deliberately not making eye contact with anyone and keeping their arms firmly at their sides. We are not interested in dancing the Hora. It’s not because we’re not happy, it’s because it does nothing to enhance our enjoyment of life and actually makes us uncomfortable. The problem is our lack of participation makes the extroverts uncomfortable. How can someone not want to dance the Hora, they ask? There can be only one explanation for them — we never tried it. If only we’d try we’d find out just what a blast it is. So they leave the Hora, seek us out, and physically haul us onto the dance floor. The Hora is a perfect metaphor for extroversion. If only we knew how much fun it was, we’d want to do it all the time! Now when I was younger, I was actually convinced that something was wrong with me. I also was way too polite to refuse. So I would let myself be pulled in by these well-meaning Hora Pullers. And then it was always a nightmare. I would freeze a somewhat horrified smile on my face and move around with the others, always wondering when it was going to start being fun. I looked awkward. I was embarrassed. Being in the Hora only emphasized my introverted nature — it did not even come close to changing it. As I got older I realized I was much better off simply politely refusing. I say things like “Nah, the Hora isn’t my thing” and I smile. It’s much better for everyone this way and I am completely happy and comfortable with it. So my message to the Hora Pullers, Spirit Leaders and Party Planners is this — I don’t need curing. There is nothing wrong with me, and when I don’t participate in your fun it doesn’t mean there’s anything wrong with you either. I like not participating in those crazy socializers. I like watching — it’s how I learn about people and how I experience large group activities. If you want to find out about me, ask me. If you want someone to talk to who will listen, talk to me. If you want someone to help you reflect, I’m your man. And if you need a speaker for a conference you’re planning, look me up! I’m kind of a strange guy, in that most of my favourite movie quotes come from animated films or sci-fi, or both. Yoda, Master Oogway, Jean-Luc Picard, Optimus Prime … all have wisdom to share. But today’s blog is about one of my very favourites, from Mr. Incredible himself, when he found out his son was going to be part of a graduation ceremony at the end of grade 4. How sadly appropriate in today’s society. Our children are bedecked with meaningless medals, they stare at shelves lined with trophies for participation, and they are celebrated in ceremonies commemorating inevitability. Society has decided that recognition of excellence must not come at the expense of the runners-up. So everyone wins. Every moment is a photo opportunity. When my son finished Kindergarten the photographer at the school put him in a cap and gown and handed him a fake diploma for the portrait! How proud we were meant to be, I wonder, that through hard work and dedication he had earned his Kindergarten diploma? I mean truly, how many parents can say their kids have managed that milestone? We manufacture their success and then we celebrate it. Then we lament the fact that this new generation comes off as underachieving, entitled, and uninspired. Thankfully we are wrong about them. But sadly the reason young people often come off this way is because we give them little choice. How is a child who is constantly rewarded in the wake of mediocre performance to learn the benefit of striving for excellence? What will inspire them if, having put forth little to no effort, they are lauded as champions? Because that is what we do. And for those children who truly shine, what is their reward, when all the others are painted with the same glorious brush? How long should we expect those kids to put in all their effort when they watch their peers work half as hard, accomplish half as much, and get praised twice as often? Because the other sad truth is that for fear of hurting those who under-perform, we under-reward those who excel. Are we doing anybody any favours with this? Of course, it’s not always like this. Happily younger generations still have the human condition, and still want to truly excel. They are inspiring, they don’t all think life is a free ride, and many of them achieve their potential. And I know many teachers – myself included – who still push for excellence and reward it when we see it, and who do not praise mediocrity or manufacture success. That may sound harsh, but it is not. Kids know when they have put forth their best effort. They know when they have broken past old boundaries. In short, they know the difference between success and failure. And when they feel that nothing special has occurred, but the world around them still celebrates their “achievement”, it is confusing for them and makes them feel like a fraud. In other words, in trying to build self-esteem by making sure everyone gets a trophy, we really reduce it significantly. By recognizing true excellence, we foster it. We dare kids to be exceptional. I have read and reread this quote to many of my students, and often just to myself. If you’ve never heard it or read it, spend some time reading it over a few times right now. If you have read it or heard it before, read it again now. Think about what she’s saying. I think about it all the time. Every time I am tempted to, say, dumb down a sentence because I think maybe the audience won’t understand it. Or every time I am singing in public and catch myself deliberately about to use my “I don’t really think I’m a singer” voice so people won’t think I’m showing off. Every time a student asks me about how I did in math when I was in high school, and I almost lie because I don’t want them to feel bad about the mark they are getting. Every time these things come up, I remember that I should dare to be exceptional, so that others will too. So I use my full vocabulary and let my students use context to figure out what I mean, I sing with intent every time, and I tell them that I was very good at math and that I had an average of 97% in my last year of high school, which was only as low as that because my English mark brought it down. Parents – love your kids but please don’t confuse love with empty praise. Challenge them to be better and praise/reward them for true excellence. Don’t be afraid for them to try something and fail, because failure feeds desire. Teachers – let’s continue to raise our expectations and celebrate when the students achieve at these higher levels, rather than lower them (as current culture would have us do) so that everyone can “succeed”. Let’s breed true success. All of us – don’t shrink from your own brilliance. Go all out every time, and watch how everyone around you starts to do the same thing. We can be so impressive when we want to. And yet here it is. I started a blog. What to expect? Because I am a high school math teacher, here I’ll likely rant about education, and how math is too often taught in a way that scars people permanently from about grade 5 on. Because I am a father, you’ll probably catch a musing or two about how I think kids should come with a manual – or at least a YouTube tutorial. Because I am a husband there is a very real possibility you’ll encounter a thought here and there about what marriage means to me, and how I can’t get over how many guys mess it up. Because I lift weights, you will certainly read posts about workouts, inspiration, transformation and frustration. Finally, because I do a lot of amateur theatre, expect a bone here and there about how that goes. That is, assuming anyone is reading. Which is really the mystery to me. Who reads these? (me, I guess) Why? (because people link to them on Facebook, to be honest). Who would read mine? Well I suppose I’ll find out.